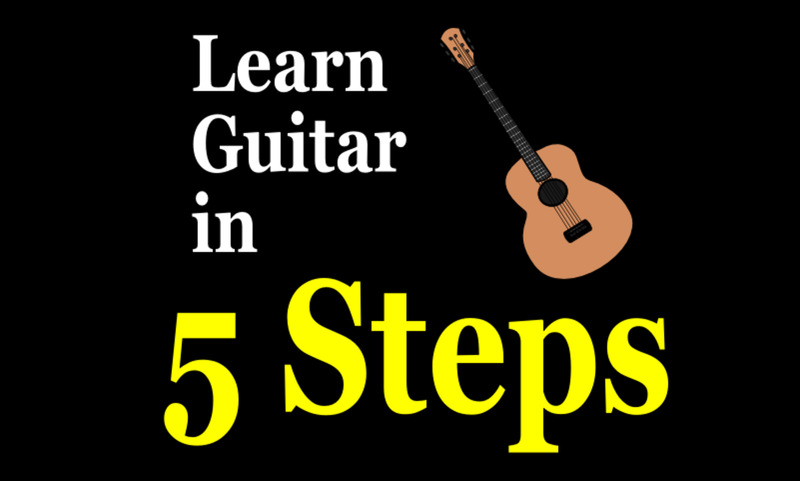 Guitar tablature, or simply, tab is used by millions of guitarists worldwide. It’s extremely simple to learn, which is its greatest strength. 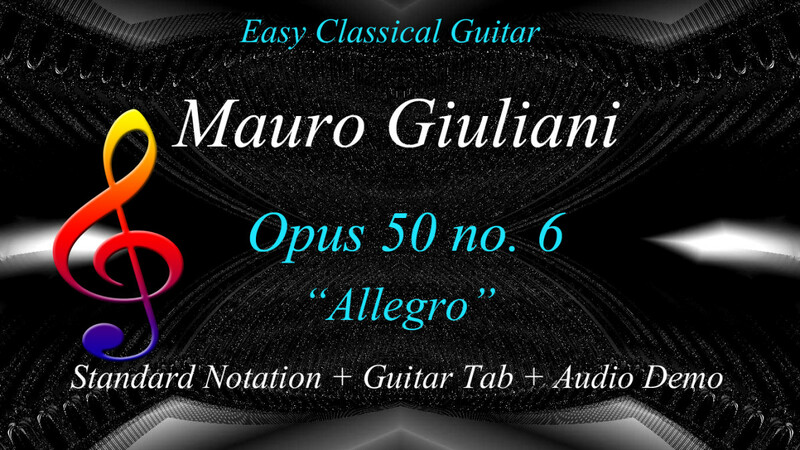 That same simplicity, however, is also its greatest weakness because, as all guitar tab readers know, basic guitar tablature, unlike standard music notation, doesn’t include timing or note duration information. You can see exactly which note to play, but when are you supposed to play it? And for how long? 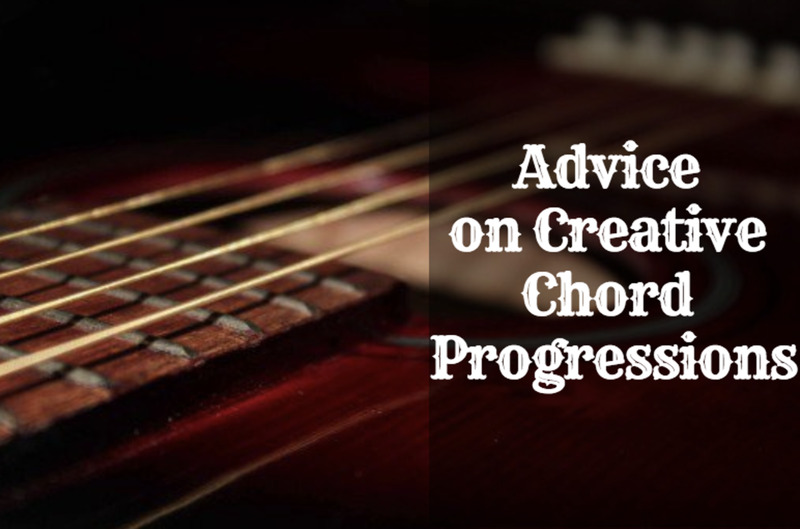 Unless you’re already familiar with the song that you’re attempting to play, there’s no way you can work it out. 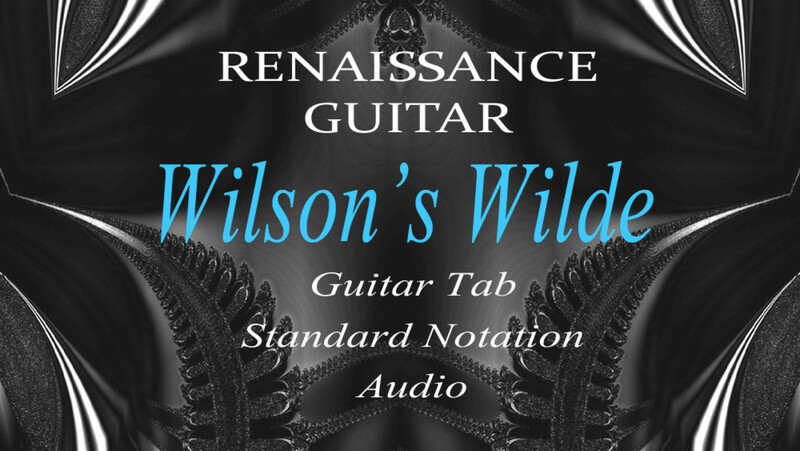 Modern guitar tablature notation programs solve the problem of timing and note duration by borrowing signs and symbols from standard music notation. 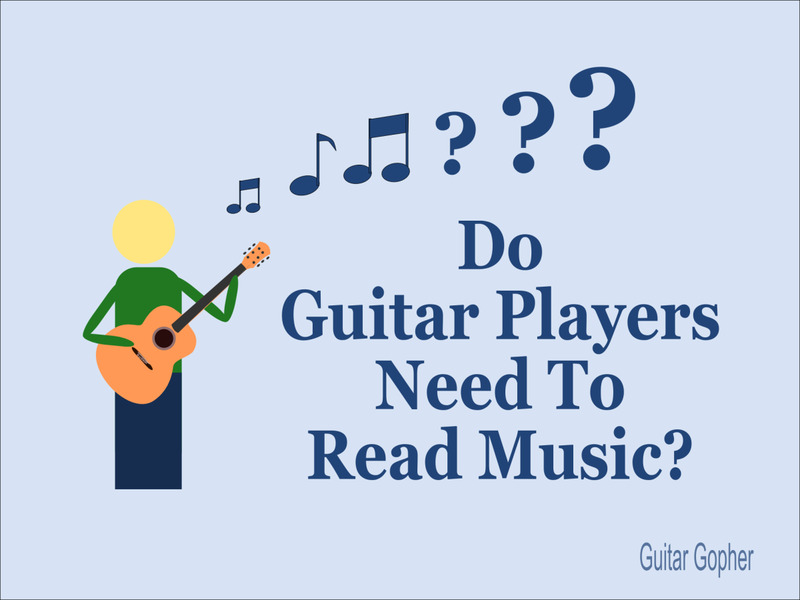 They can be placed underneath or above the tablature. The problem there, though, is that unless you already read standard music notation, those signs and symbols won’t mean much. The purpose of this article is to explain to “tab only” readers the basic timing and note duration aspects of standard music notation. This way the reader can get an understanding of timing without going through the laborious and time consuming process of learning to read music in standard notation. Not that a knowledge of standard music notation isn't worthwhile. 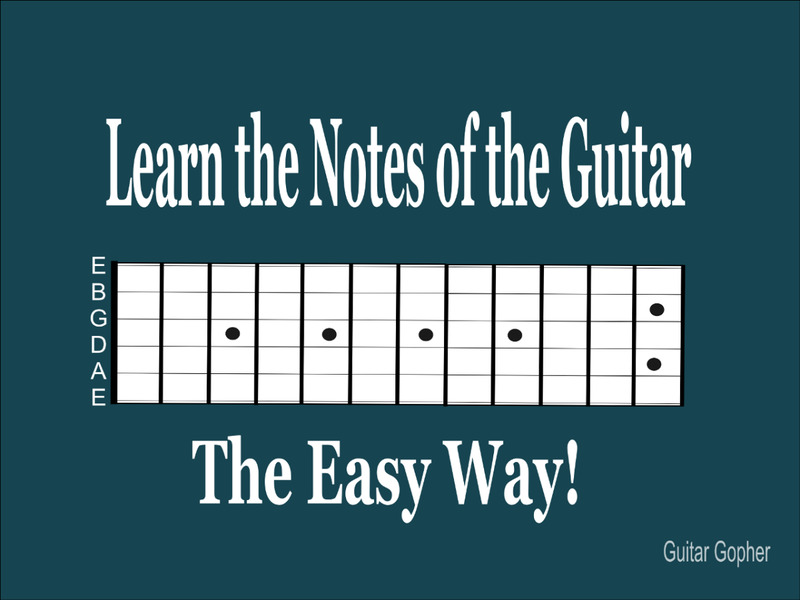 It’s very worthwhile, in fact, and if you’d rather learn that, then please feel free to visit my tutorial: Standard notation for guitarists. 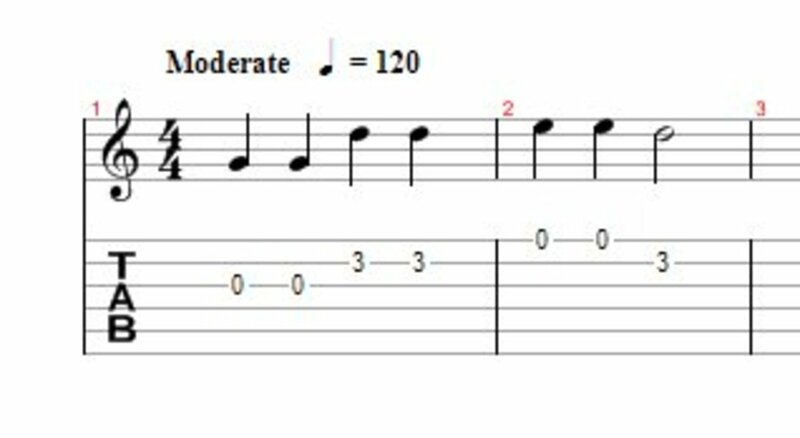 Also, if you're not already familiar with guitar tab, you can learn the basics of it in my guitar tab basics tutorial. As a tab reader, you’re probably already familiar with the basic timing elements of music such as the beat and the equal grouping of beats called the meter (beats to the bar or measure). In standard music notation and quite often in basic guitar tablature too, vertical lines, called bar lines are used to separate these equal beat groupings into bars or measures. The different shapes of the note symbols represent the duration of the notes in relation to each other. As their names suggest, a whole note lasts twice as long as a half note, which lasts twice as long as a quarter note, which lasts twice as long as an eighth note. Another way to think of it is, a whole note lasts as long as two half notes, or four quarter notes or eight eighth notes. Notice the last two notes in the example. The first of them is an eighth note on its own. That's what eighth notes look like when they're not joined up (beamed) to others. Beaming them together in pairs makes it easier to keep count while reading them in real time. The last note is a dotted quarter note. Placing a dot after any note increases its duration by half the value. So a dotted quarter note will last as long as a quarter note plus an eighth note. There are even shorter note durations than eighth notes which we'll look at later in this lesson. The way to ensure that the note durations are exact is to have a steady beat going on mentally (or with a metronome if you want to be really precise). Each note duration will correspond to a fixed number of beats. The time signature tells us how many beats. The number at the start, (4/4) is called the time signature. In this case it's called a "four-four" time signature. The top number tells us the meter, or the number of beats in a bar or measure. In this case it's 4, so we count "one-two-three-four" repeatedly throughout the music. The bottom number tells us which of the above note durations is equal to a single beat. In this case it's 4 again. That means a quarter note will last exactly one beat. Every complete bar or measure will have a total of four beats, and the note durations will always add up to the equivalent of four quarter notes, whether it's actually four quarter notes or two half notes or any mixture of note durations, such as a half note plus a quarter note plus two eighth notes. Now we can play all the notes with the correct note durations relative to each other. But how fast should we count the "1-2-3-4"? The tempo sign at the top tells us the answer. It's telling us that we should play at a moderate speed (tempo) of around 120 beats per minute, (2 beats per second). Usually tempo indications aren't included and you can use your discretion to choose a suitable tempo. Count a steady beat and play each note above the appropriate beat number. Most tabs don't come with a handy music staff attached, but there are other ways of using the standard music notation symbols without including the whole standard notation staff. The tab below shows the same example as above but with abbreviations of the note lengths above the notes shown as W, H, Q and E. W = wholenote; H = half note, etc. The dotted quarter note is shown with a dot placed after the last Q. The example below shows another way of including timing and note duration information. The whole note has no symbol, the half notes are shown by a short line, and the quarter notes by a longer line. Eighth notes are shown with their 'flags' (beams) attached and the dotted quarter note, again, is shown with a dot attached. Notes shorter than eighth notes are shown by adding extra flags or beams to the note's stem. The example shown is of an incomplete bar containing sixteenth notes and thirty-second notes. The counting requires adding extra syllables drafted in for counting sixteenth notes as 1 e & a 2 e & a, etc. For even shorter notes such as thirty-second notes or sixty-fourth notes, adding more syllables isn't practical. Instead we mentally group them into the main beats or fractions of a beat (whichever we feel most comfortable with). Here's are some well known musical phrases in tab with duration info shown in the different ways explained above. If you read and play the notes with the correct timing, you, should be able to recognise the tunes. The first example has an accompanying notation staff. The symbols at the start indicate musical rests (periods of silence) that aren't included in the tab. Notice that the first note in this piece has an upward pointing stem. That's simply a convention to keep the stems within the staff. Any note below the middle line of the staff will usually have upward pointing stems. Stem direction makes no difference to the timing and can be ignored. An exception to this convention is when the staff shows more than one part. The guitar is a harmonic instrument and guitarists can play more than one part at the same time, such as a melody and bassline. To show the different parts, the melody will have upward pointing stems and the lower part will have downward pointing stems. This keeps the stems of the two parts separate and allows you to see both parts clearly. Tab doesn't make any distinction between parts. Here's another one for you to try, this time with a shorthand version of the note durations. Watch out for the dotted notes. Notice that there's also a new time signature, which is 3/4, three-four. This simply means that each measure will have note durations amounting to three quarter beats, instead of four. Finally, here's one written using ascii text characters; the kind of tab most commonly found online due to requiring no special software to make it. No time signature is shown but you can more or less work out that it's 4/4 by adding the note durations within each measure. Again, watch out for the dotted notes. How are musical rests shown in tablature? Musical rest symbols aren't usually shown in tab, especially hand-written tab - instead blank spaces are left in their place. You can see that in a couple of the examples in the article. Some software tab writers do put musical rests in though. Thanks Aficionada - It's rewarding to be complimented by fellow musicians and teachers, especially those who, like you, produce consistently high quality work. Another great article. Helpful, interesting information conveyed clearly and engagingly. Well done!